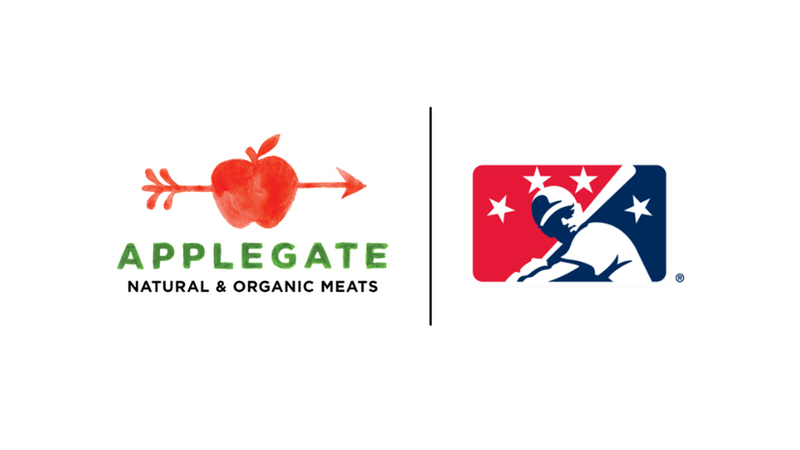 ST. PETERSBURG, Fla. and BRIDGEWATER, N.J. -- Minor League Baseball™ (MiLB™) today announced that Applegate Farms, LLC, the nation's leading natural and organic meat company, will become the "Official Natural and Organic Meat of MiLB," the first-ever partnership in the category for Minor League Baseball. By partnering with Minor League Baseball, Applegate will give fans cleaner, more natural choices of traditional ballpark staples -- including "The Cleaner Wiener™" -- Applegate's 100 percent grass-fed beef hot dogs. Made with only simple ingredients (100 percent grass-fed beef, water, salt and spices) and never any chemical nitrites or nitrates added, fans can spend more time thinking about how to top their hot dog versus what's inside. The Applegate "cleaner, crave-able food for everyone" mantra will carry over to concessions options at select Minor League Baseball ballparks, with teams offering "The Cleaner Wiener" and a variety of cleaner meats from the Applegate product lineup on their menus, giving fans a more natural meat option. "Minor League Baseball is built on pure, authentic and fun experiences in our ballparks and making connections with fans," said David Wright, chief marketing and commercial officer at Minor League Baseball. "Applegate employs the same principles to produce and promote clean and natural products, making this relationship an ideal pairing." "Partnering with Minor League Baseball was a no-brainer for Applegate. Not only do both brands have similar values, but you can't argue with the iconic pairing of hot dogs and baseball," said Nicole Glenn, vice president of marketing at Applegate. "We are very excited for the opportunity to serve our products across the country, especially hot dogs at concessions stands, at select Minor League Baseball ballparks and hope attendees will choose Applegate during their next grocery store visit." As a part of an integrated media plan, Applegate will have dominant positioning throughout the MiLB digital network where fans can engage with unique and custom content. Additionally, using ISM Connect technology, Applegate's simple and humorous messaging will be featured in ballparks across what will be the largest in-venue digital engagement network in sport and entertainment. Applegate became a stand-alone subsidiary of Hormel Foods in July 2015. For more information about our products, visit www.applegate.com or talk with us on www.facebook.com/applegate or twitter.com/Applegate.